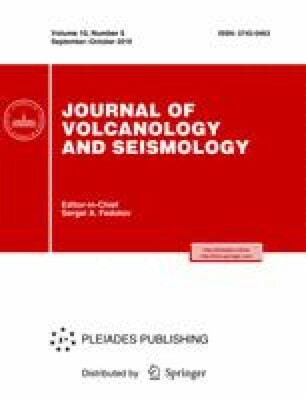 New data are reported relating to the presence and relative concentrations of organic compounds of medium volatility in samples from the water of hot springs and in the condensate of a steam–water mixture from wells drilled in the Mutnovskii geothermal area and from a well and springs in the Uzon caldera. The Mutnovskii area was found to contain 95 compounds belonging to 16 homologous series, with 71 compounds (12 series) in the Uzon caldera. Among these we found homologous series of biologically important compounds: carbonic acids, alcohols, ethers, aldehydes, ketones, and others. Evidence was obtained for a contribution of the abiogenic component in organic matter from sterile condensates of an overheated steam–water mixture from wells (alkanes, aromatic hydrocarbons, ketones, alcohols, and others) and in thermal water from natural discharges (in particular, alkanes and chlorine-containing hydrocarbons). The results of this study can be used for the preparation and conduction of laboratory experiments in prebiological chemistry under conditions that simulate a hydrothermal environment. Original Russian Text © V.N. Kompanichenko, V.A. Poturay, G.A. Karpov, 2016, published in Vulkanologiya i Seismologiya, 2016, No. 5, pp. 35–50.